The Navy Broadway Complex, which is currently the home of the Navy's regional headquarters, will make way for a new mixed-use development. Manchester Pacific Gateway will feature six buildings totaling 3 million square feet within eight-city blocks. A rendering of the Manchester Pacific Gateway project. SAN DIEGO—Locally-based Manchester Financial Group reports it has launched its $1.5-billion re-development of the nearly 14-acre Manchester Pacific Gateway project. The beginning of construction in August was the culmination of more than a decade of work by Manchester Financial on the project. The company states that the project is the largest private waterfront development on the West Coast. The Navy Broadway Complex, which is currently the home of the Navy’s regional headquarters, will make way for a new mixed-use development. Manchester Pacific Gateway will feature six buildings totaling 3 million square feet within eight-city blocks, including a new 17-story Class-A office building for the U.S. Navy headquarters. “In the 12 years that we have worked on this development, our enthusiasm and commitment has never wavered,” says chairman emeritus of Manchester Financial Group, Papa Doug Manchester. “The Navy is excited to break ground on a new, state of the art Navy Administrative Building. The Navy and San Diego have had a strong, mutually beneficial relationship for over 100 years and this project is another important chapter in that history,” states Rear Admiral Yancy B. Lindsey, commander, Navy Region Southwest. 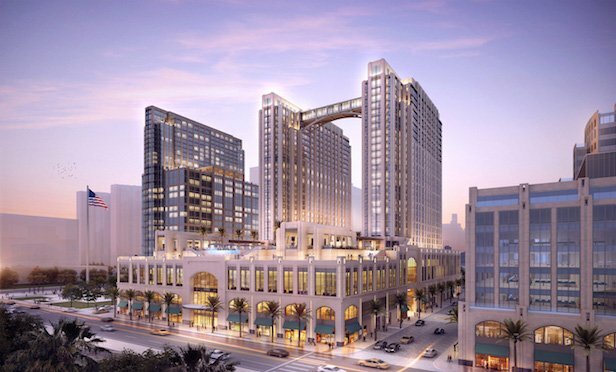 Envisioned by Papa Doug Manchester, developer of the Marriott Marquis San Diego Marina, triple five-star Fairmont Grand Del Mar, and Manchester Grand Hyatt, the development will serve as the grand entryway to San Diego’s central business district and downtown tourist community. Manchester has hired architect, Gensler, general contractor Turner Construction, Urban Strategies Group of Flocke & Avoyer for retail leasing, and Cushman & Wakefield for office leasing for the venture. • Block 1: 1.9-acre plaza; 29-story, 467,000-square-foot office tower; 68,000 square feet of retail; 198,000-square-foot luxury boutique hotel with 235 rooms. • Block 2: 29-story, 1 million-square-foot convention center hotel with 1,100 rooms; 37,000 square feet of supporting retail. • Block 3: 11-story, 197,000-square-foot office building and 75,000 square feet of retail; 17-story, 373,000-square-foot Navy headquarters in a Class A building. • Block 4: Eight-story, 186,000-square-foot office tower; and 91,500 square feet of retail; four-story, 28,500-square-foot office tower; and 63,500 square feet of retail.